To meet Polk County’s future water needs, the District and county will be investigating the Lower Floridan aquifer as a potential alternative water source. primary water source for public, agricultural and industrial uses. The District’s 2015 Regional Water Supply Plan identifies a 22 percent increase in water supply will be needed to meet future demand in Polk County by 2035. The District is committed to exploring alternative water supplies (AWS), such as the brackish groundwater from the Lower Floridan aquifer (LFA), to help meet future demand in this region. Little is known about the lower aquifer’s characteristics within Polk County and how its long-term use may affect the upper aquifer. A better understanding of the LFA geology and hydraulic properties, water quality and quantity, and the potential for drawdown and movement of saline water is necessary to evaluate any future plans. The new data will enhance groundwater modeling of the LFA and determine the feasibility of developing the lower aquifer as a new water source in areas of Polk County. The District in partnership with Polk County is currently exploring the LFA to assess its viability as an AWS source. 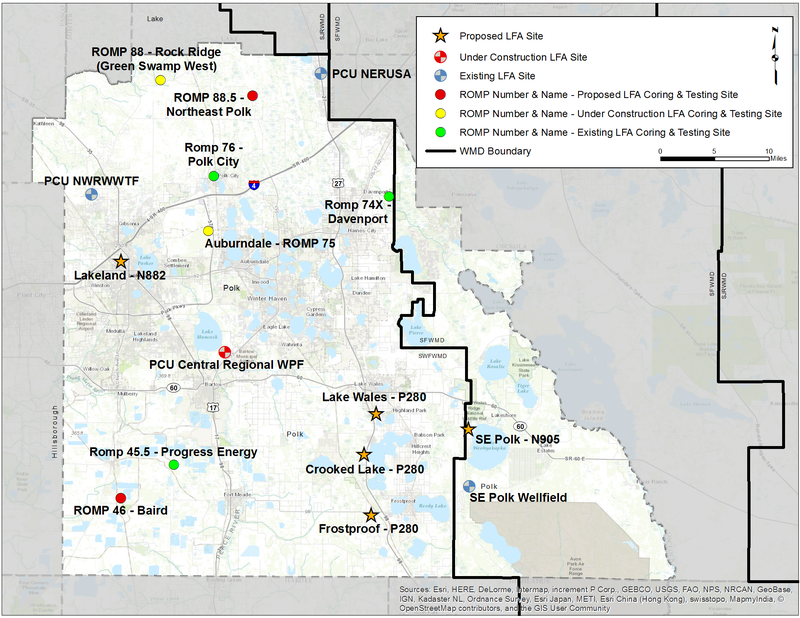 The investigation involves drilling exploratory wells at three key locations, chosen for their proximity to the proposed Southeast Polk Wellfield, and to improve data coverage for groundwater resource monitoring and flow modeling. The District has contracted with three consulting firms experienced with the design and testing of Floridan aquifer system wells to conduct this project. The three sites and tentative timeline are provided below. George Schlutermann, senior hydrogeologist, at (352) 796-7211, ext. 4212.